Stinging cells, produced by cnidarians such as jellyfish and anemones, are one of ocean creatures' most effective defences. This method of protection can keep almost all predators at bay - but not the kaleidoscopically colourful sea slug. Nudibranchs, commonly known as sea slugs, are a group of shell-less marine molluscs. Their name means 'naked gill', referring to the breathing apparatus on the outside of their soft bodies. These gastropods can be vibrantly coloured, with hues from bright purples and vivid blues to fluorescent oranges, earning them common names including 'dragon' and 'clown'. But these slugs aren't joking around. Some species of nudibranch have turned to a life of crime, robbing prey of their only defences: their stings. Nematocysts are the venomous stinging cell organelles produced by cnidarians such as jellyfish. They're a highly effective defence mechanism, able to keep a number of threats at bay. But the sea slugs in the group Aeolida are practically impervious to these spiny javelins, despite their soft bodies. The aeolid animals employ a coating of chitin, a glucose derivative, in the front part of their digestive system which can deflect the cnidarian attacks. Any harm done is rapidly repaired. Deflecting the blows and showing no weaknesses, the nudibranch will continue moving towards the cnidarian, most commonly a sea anemone, in the hopes of a well-earned meal. Instead of digesting the nematocysts, the slug steals them for itself. The acquired cell organelles are then recycled into the flamboyant, tentacle-like cerata on their backs. The now stinging organelle-enhanced nudibranch, if it ever finds itself at risk, will re-fire the hijacked nematocysts, as though they were always their own. Glaucus atlanticus - also known as the sea swallow, blue angel or blue dragon - looks especially unusual. The cerata of this species are not on its back but positioned like wings, stretching out from its sides, with 'feathers' of varying lengths. This otherworldly looking species, first described in 1777, floats at the surface of the water on its back, using currents and wind to carry it across the ocean. Like many other nudibranchs, the sea swallow harnesses the venom of its prey. But this small slug will also take on colonies of floating cnidarians. This includes the Portuguese man-o-war, an open-sea colonial animal that is closely related to jellyfish and whose sting can sometimes be fatal to humans. But the sea swallow is picky when it comes to harbouring stinging cells. Instead of taking everything it can get, the slug only stores the larger of the two main types of nematocyst made by their buoyant prey. This is probably to ensure that the slug has maximum power when stinging its own predators. A specimen of Glaucus atlanticus that was collected on the Challenger expedition is held in the Museum's collections. At a length of just 12 millimetres, the specimen was pulled from the surface of the Pacific in July 1875. It was then preserved in glycerine on a slide. The species was originally described inaccurately, resulting in an incorrect labelling when it was accessioned to the Museum in 1888. The small slug was originally believed to be Glaucus longicirrus, but this name was later acknowledged as a synonym for G. atlanticus. Sea swallows may look delicate in real life, let alone in glass. In the late nineteenth century, Leopold Blaschka and his son Rudolf created over 10,000 detailed glass models of sea-dwelling invertebrates, including a replica of G. atlanticus. Museum Conservator Chelsea McKibbin worked on the sea swallow model before it went on display at the Museum. At 5.5cm in length and 3.75cm at its widest, the model is close to the size of a live sea swallow. 'When you take the living animal out of the water, they shrink back and collapse. Constructed from several individual and exceptionally delicate pieces of glasswork, the model needed a little conservation before it could go in display. 'The glassmakers' method for attaching appendages is animal glue - so the brown adhesive you can see. It is applied to glass, which is a really smooth material, so over time some of the appendages had fallen off,' says Chelsea. Using monofilament, which is similar to fishing line, Chelsea made prototypes and eventually the final reconstruction of the missing 'wing', finishing by painting it the same shade as the original model. Although the replica is displayed alongside the original model, it will not be permanently attached. Chelsea explains, 'I want to make sure we are accurately depicting the specimen, but I don't want to attach it directly because it is not an original part. Find out more about why we are working to protect the oceans. Face your fears and test your knowledge of venomous creatures. Find out how the Gila monster's venom has the ability to save lives. Venom and poison can both be deadly, but they're two distinct natural weapons. 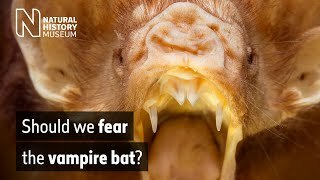 Do vampire bats drink blood? Do vampire bats really deserve their blood-sucking reputation? Sponges are unsung heroes for thousands living with chronic illnesses.